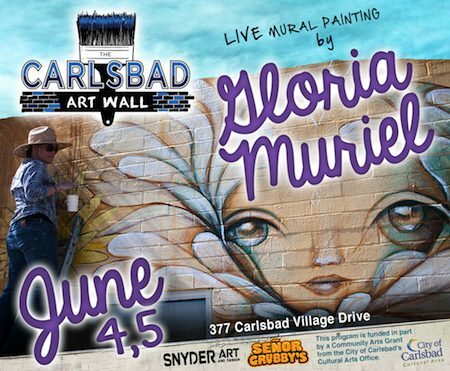 On June 4-5, 2016 the Carlsbad Art Wall at 377 Carlsbad Village Drive, in Carlsbad, California will be home to new mural by San Diego based muralist Gloria Muriel. Through her art, Gloria creates a portal to her own cosmic dreams and fantasies. She shows us a unique and magical world that exists beyond our reality—a universe in complete harmony with nature. Gloria’s intention is to awaken hearts and open minds to the raw novelty of the present moment. Meditation helps guide her to see the divine presence found in everything that exists. . . Gloria’s murals are often based around the geometries of a face, with lines and patterns borrowed from the natural world — elements of flowing water and sublime vegetation suggest an abundance of growing, healing, and evolving life. Her murals can be found in Mexicali, Tijuana, Guadalajara, Mexico City, San Diego, San Francisco, Los Angeles, and Miami. For more info on Muriel and the Carlsbad Art Wall, please follow the jump. 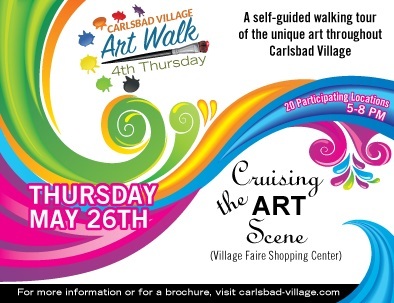 The Village of Carlsbad’s 4th Thursday Art Walk is this Thursday, May 26, 2016 beginning at 5 PM. Throughout the Village, 20 different locations are waiting to welcome you with light refreshments and fantastic local and regional art ranging from photography, oil, sculpture, woodworking, and so much more! For more info on what some of the participating businesses have planned, please follow the jump. 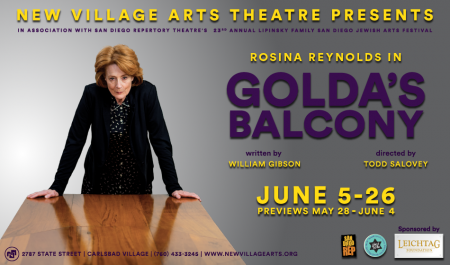 The longest-running one-woman show in Broadway history, Golda’s Balcony tells the incredible story of Golda Meir, Israel’s first female prime minister. On the eve of the 1973 Yom Kippur War, in which Egypt and Syria mounted attacks on Israel, Meir reflects upon her life and relives key moments in her political and spiritual development. As she inches closer to nuclear war, Meir must confront the question that has echoed since she took office: what happens when ideology becomes power? 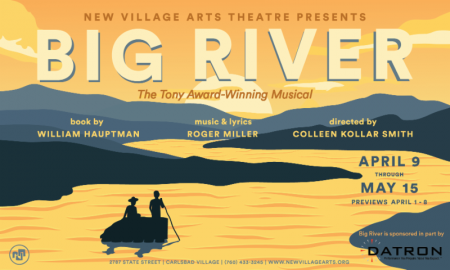 Previews for this New Village Arts presentation begin Saturday, May 28, 2016 at 8pm and continue Sunday, May 29 at 2pm, Thursday, June 2 at 8pm, Friday, June 3 at 8pm and Saturday, June 4 at 8pm. The production will host a soft opening on Sunday, June 5 at 2pm. 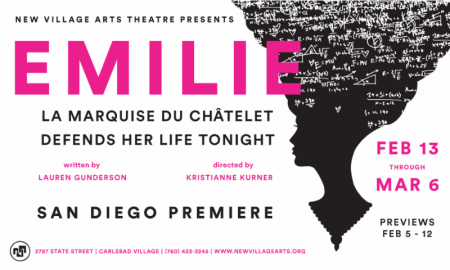 The New Village Arts Theatre is located at 2787 State Street, in the heart of the Village of Carlsbad, California. To buy tickets, please click the link. 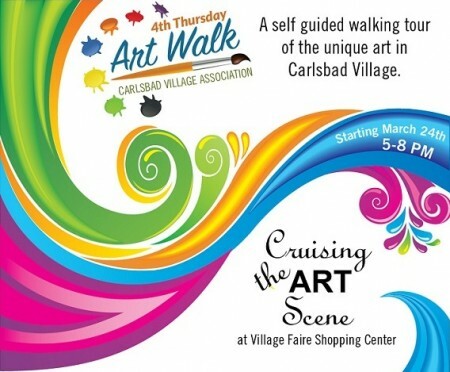 The Carlsbad Village Association is welcoming the returns of Art Walk only now it’s called the 4th Thursday Art Walk. And it kicks off on Thursday March 24, 2016. 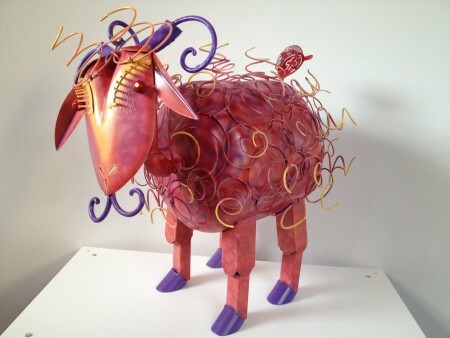 Art Walk, held in conjunction with Cruising the Art Scene at the Village Faire Shopping Center, is a self-guided tour of art galleries in the Village, as well as stores that also feature local and regional artwork. You can visit nearly 20 different locations throughout the Village, as well as see numerous murals during your tour. Half a dozen locations will also feature live music and many will serve light snacks and refreshments. Come experience Carlsbad Village in a whole new way! For all the details (including a list of participants) please click the link. 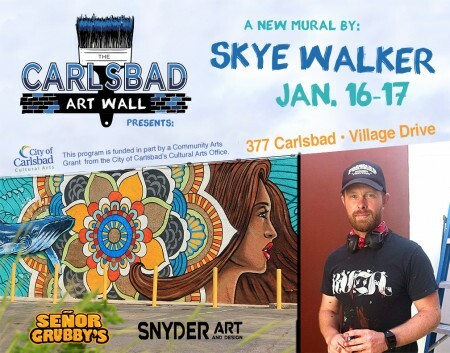 The Carlsbad Art Wall at Señor Grubby’s is getting a whole new look on the weekend of January 16, 2016 as Encinitas based artist Skye Walker takes over the east wall of the Carlsbad eatery. The first 2016 CAW artist Skye Walker will bring his life-long love for illustration, design and mural painting to the CAW with his signature colorful composition of nature and environmentally conscious iconography. Walker found his love for art in his early youth while traveling the country with the family bluegrass band named EarthWalkers. They logged over 2,000 shows nationwide singing about preserving the environment. During this time, Walker’s father taught him the art of lettering and murals. His father was an accomplished sign painter and muralist in the 70’s and 80’s. The City of Carlsbad’s Cultural Arts Office presents a new installation in the Carlsbad Sculpture Garden, located at 2955 Elmwood St., immediately north of the city’s Georgina Cole Library. Leslie and Paul Wilton: Reclaimed, Repurposed, Remembered features nine sculptures created by Escondido artists Leslie and Paul Wilton of Metalmorph Sculpture Studio. A free opening reception will be held on Thursday, Jan. 28, from 5 to 7 p.m., hosted by the Carlsbad Friends of the Arts. The Sculpture Garden is open Monday through Thursday from 9 a.m. to 4 p.m., and admission is free. It’s December 1942, and New York’s little-radio-station-that-could, WOV, is about to air its final broadcast of the holiday-themed Mutual Manhattan Variety Cavalcade. That’s the setting for The 1940′s Radio Hour, a timeless play full of classic tunes sung in four- and five-part harmony. With its dance routines, swinging music — including “Ain’t She Sweet,” “Blue Moon,” “You Go to My Head” and “Have Yourself a Merry Little Christmas” — and beloved cast of characters, Radio Hour is a perfect holiday treat.